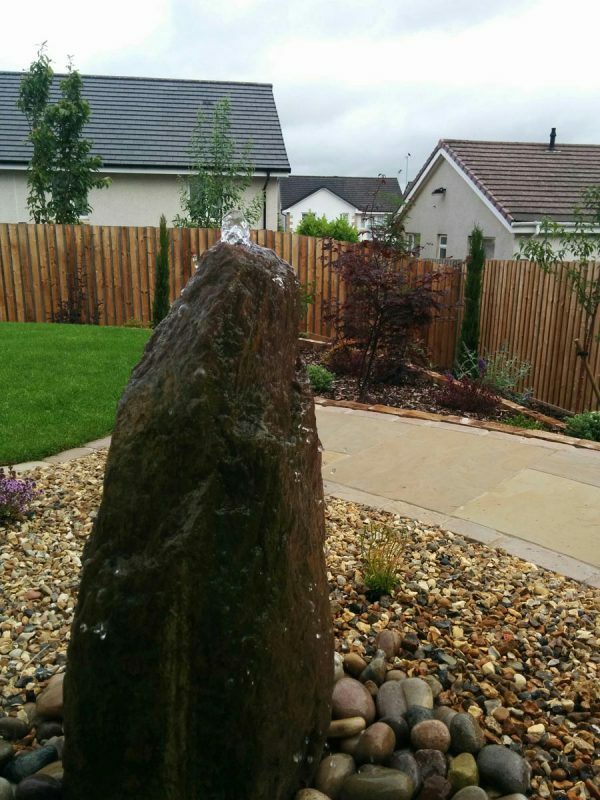 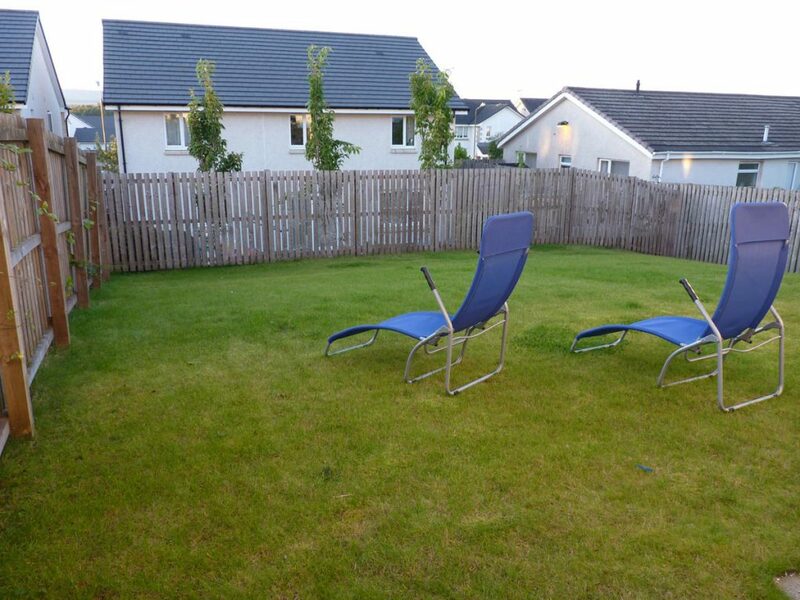 This garden in Dunblane had the characteristics of most new builds: some poor quality lawn and very little else. 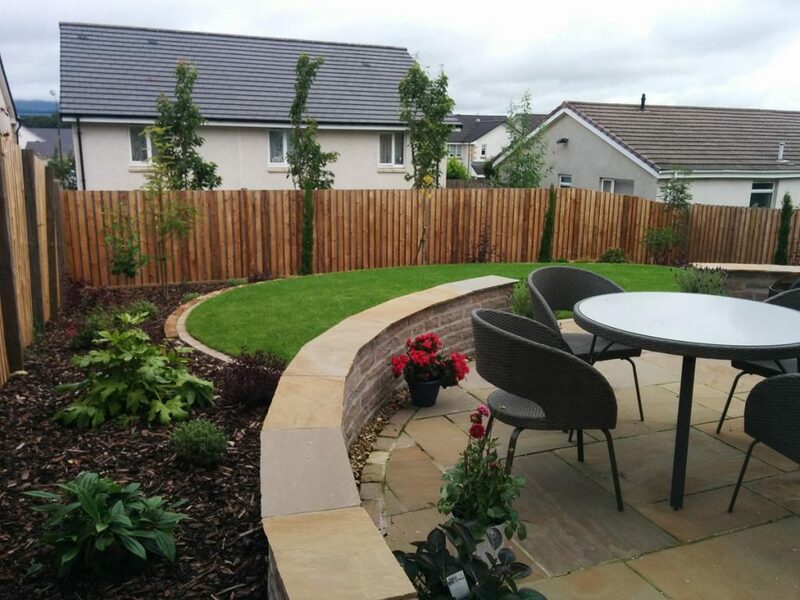 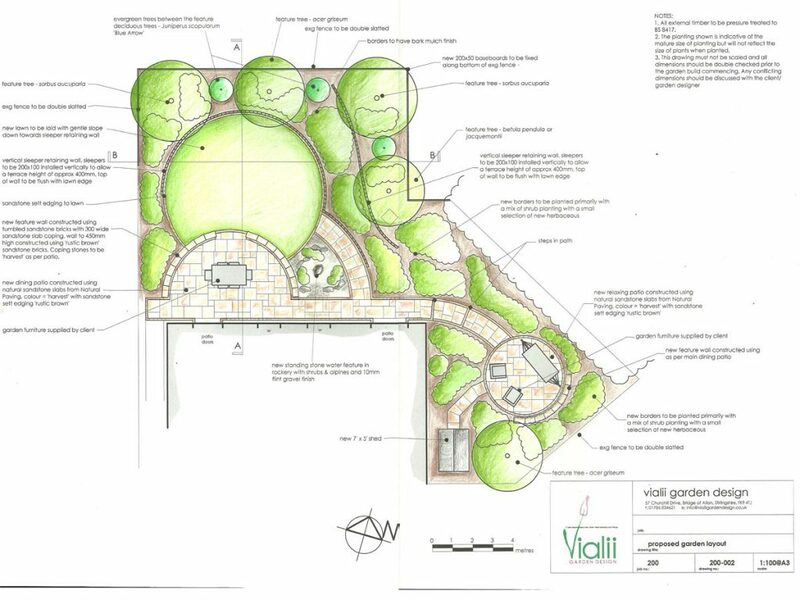 The clients wanted us to help them work with their sloping garden to create a more usable space as well as dealing with their difficult slope and privacy issues. 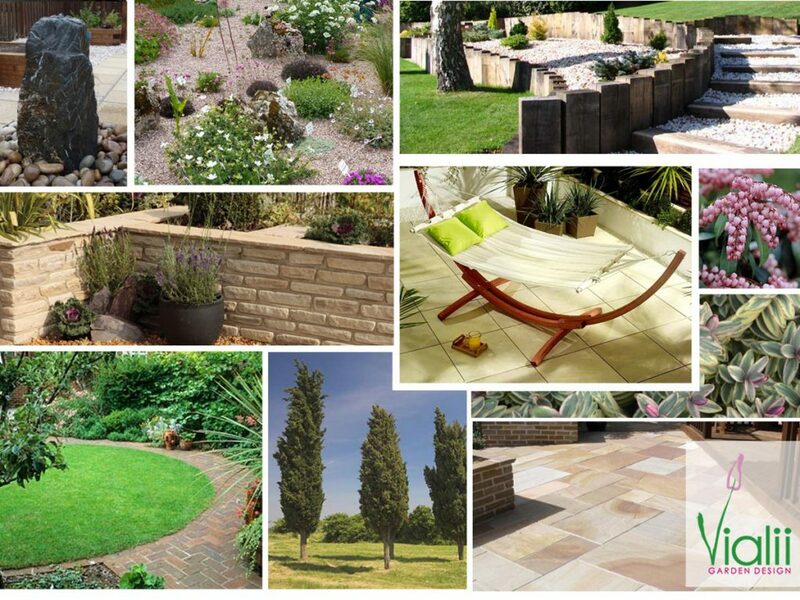 "We were hugely impressed at the quality of the hard landscaping in particular, although the planting was also wonderful and exceeded our expectations." 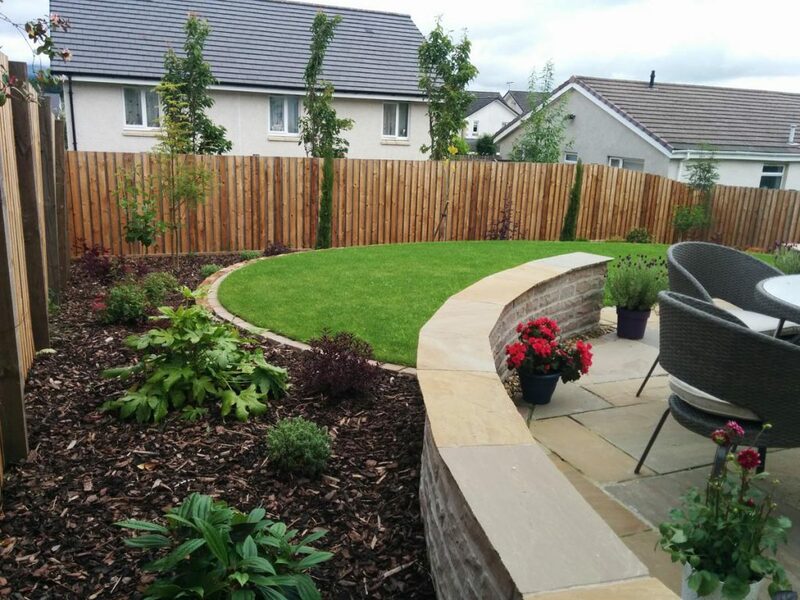 We used vertical sleepers to make curving retaining walls, creating soft and attractive terraces and thus dealing with the troublesome slope. 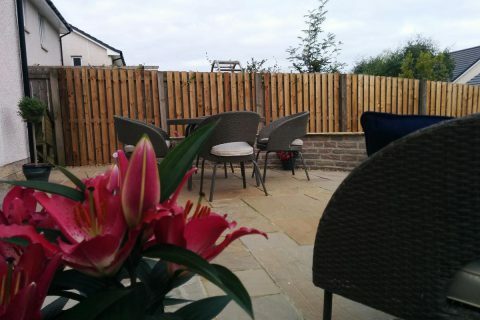 A large dining patio was made from sandstone with a complementary low wall around it allowing plenty of space for entertaining and perching on the wall. 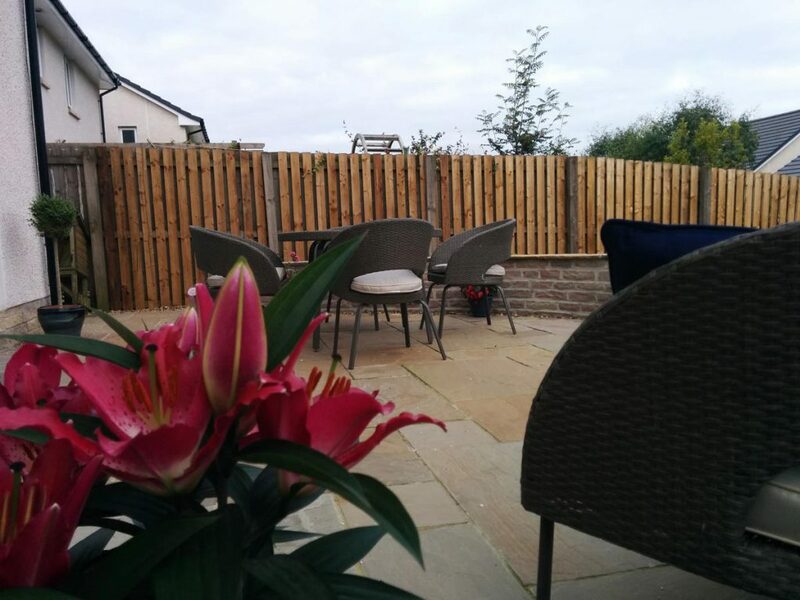 The new round lawn was edged with sleepers and creates a much more usable space. 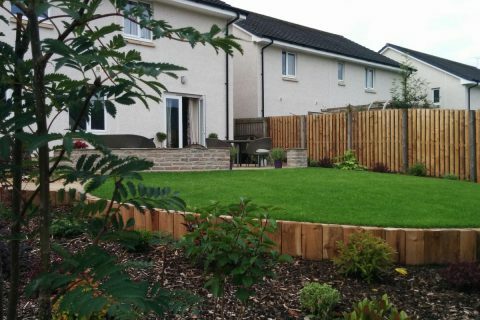 Sleepers were also used in the bottom area of the garden to create areas for planting and trees were added to ensure privacy in coming years. 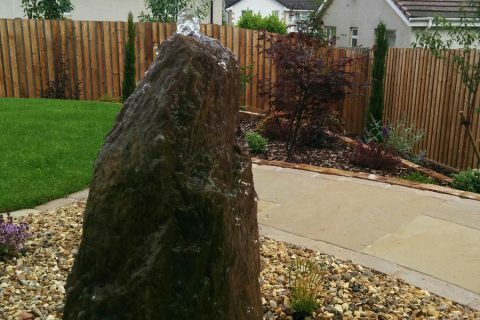 An alpine border with a standing stone water feature was located beside the dining patio. 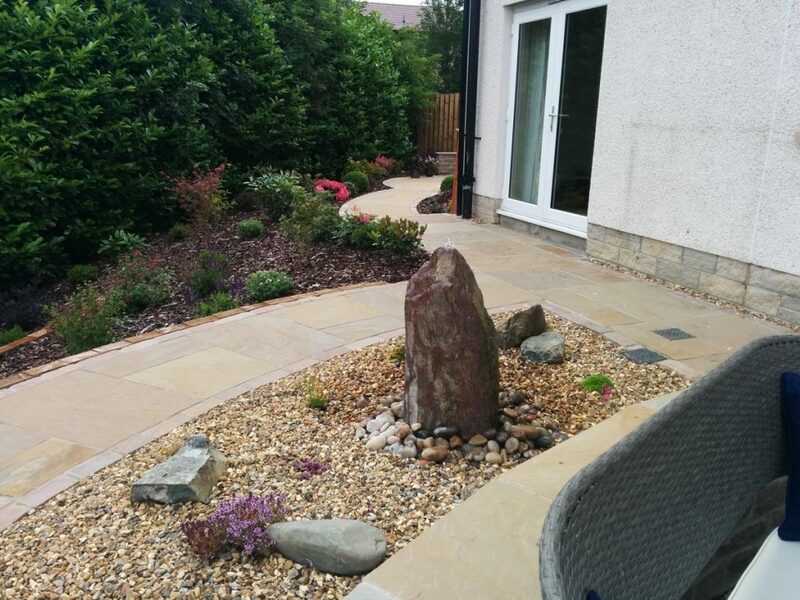 A new path leads round to a second patio in a private area of the garden, a perfect place to relax in a quiet corner. 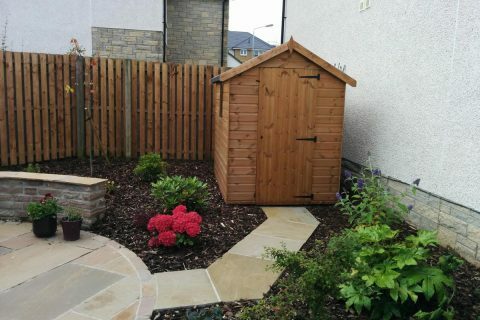 Space for a new shed was created and tucked into the corner. 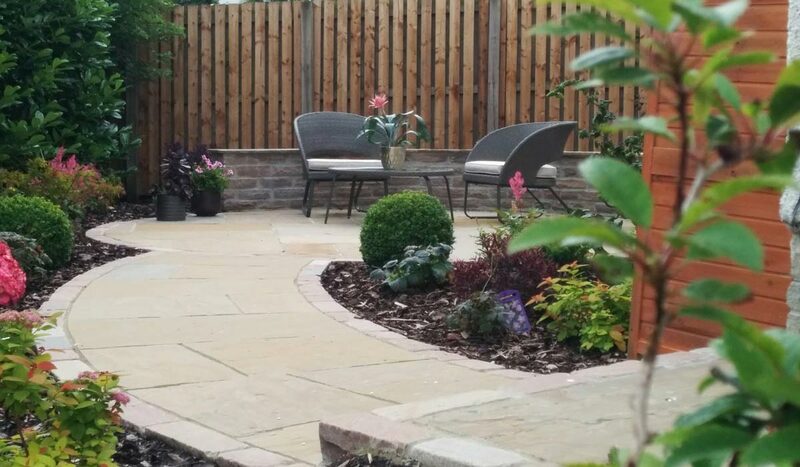 A wide range of shrubs were used to create year round interest and structure in this garden as well as keeping it low maintenance including skimmia, syringa, choisya, viburnum, weigela, hebe, fatsia and buxus to name but a few. 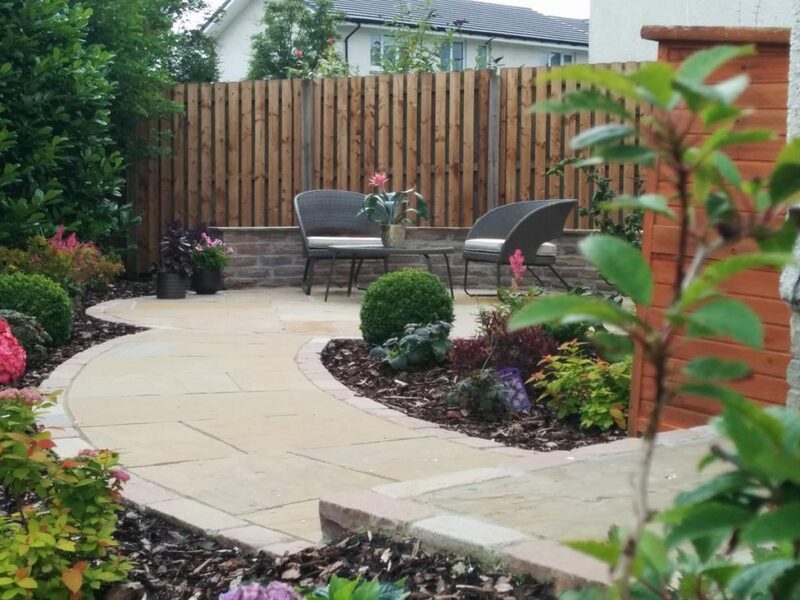 A few herbaceous plants such as geranium, astilbe and salvia were included for some additional colour and interest. 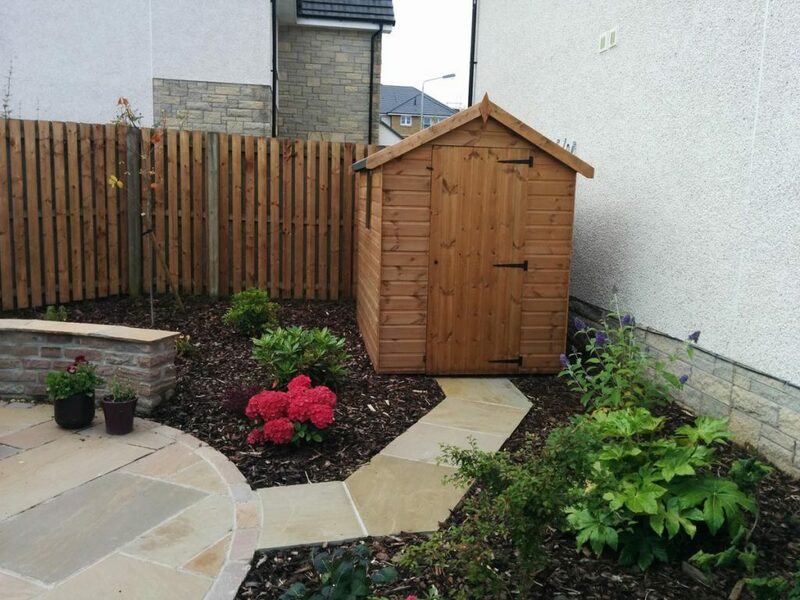 To help with privacy several trees were added including acers, cypress and rowan.